MongoDB Atlas customers can enable cross-region replication for multi-region fault tolerance and fast, responsive reads. Improved availability guarantees can be achieved by distributing replica set members across multiple regions. These secondaries will participate in the automated election and failover process should the primary (or the cloud region containing the primary) go offline. Read-only replica set members allow customers to optimize for local reads (minimize read latency) across different geographic regions using a single MongoDB deployment. These replica set members will not participate in the election and failover process and can never be elected to a primary replica set member. In this post, we’ll dive a little deeper into optimizing for local reads using cross-region replication and walk you through the necessary configuration steps on an environment running on AWS. A read replica is simply an instance of the database that provides the replicated data from the oplog; clients will not write to a read replica. With MongoDB Atlas, we can easily distribute read replicas across multiple cloud regions, allowing us to expand our application's data beyond the region containing our replica set primary in just a few clicks. 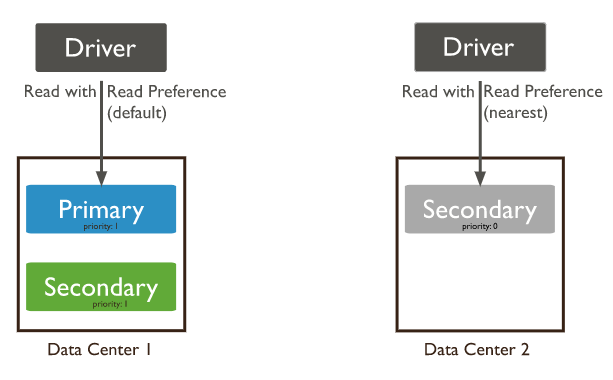 To enable local reads and increase the read throughput to our application, we simply need to modify the read preference via the MongoDB drivers. We can enable read replicas for a new or existing MongoDB paid cluster in the Atlas UI. To begin, we can click on the cluster “configuration” button and then find the link named "Enable cross-region configuration options." As you can see above, we have our preferred region (the region containing our replica set primary) set to AWS, us-east-1 (Virginia) with the default three nodes. We can add regions to our cluster configuration based on where we think other users of our application might be concentrated. In this case, we will add additional nodes in us-west-1 (Northern California) and eu-west-1 (Ireland), providing us with read replicas to serve local users. Note that all writes will still go to the primary in our preferred region, and reads from the secondaries in the regions we’ve added will be eventually consistent. We’ll click "Confirm and Deploy", which will deploy our multi-region cluster. Specifies the replica set read preference for this connection. MongoDB Atlas allows us to peer our application server's VPC directly to our MongoDB Atlas VPC within the same region. This permits us to reduce the network exposure to the internet and allows us to use native AWS Security Groups or CIDR blocks. You can review how to configure VPC Peering here. At this time, MongoDB Atlas does not support VPC peering across regions. If you want to grant clients in one cloud region read or write access to database instances in another cloud region, you would need to permit the clients’ public IP addresses to access your database deployment via IP whitelisting. With cross-region replication and read-only replicas enabled, your application will now be capable of providing fast, responsive access to data from any number of regions. Get started today with a free 512 MB database managed by MongoDB Atlas here.